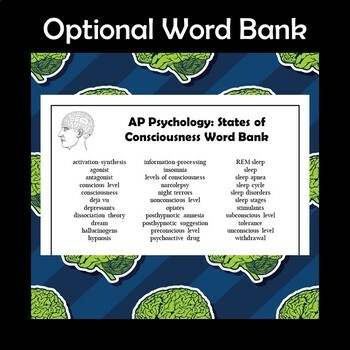 A strong knowledge of vocabulary is one of the most important factors for success on the AP Psychology test. Crossword puzzles are a great way to teach, learn, reinforce, and review all of the vocabulary terms students might encounter on the exam. 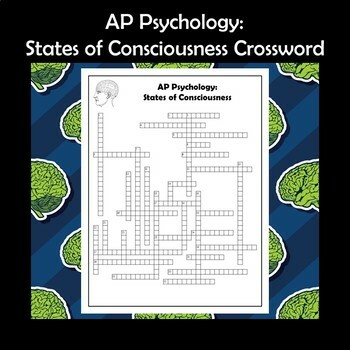 This crossword puzzle features 33 important vocabulary terms about states of consciousness that are likely to be featured on the AP Psych exam. 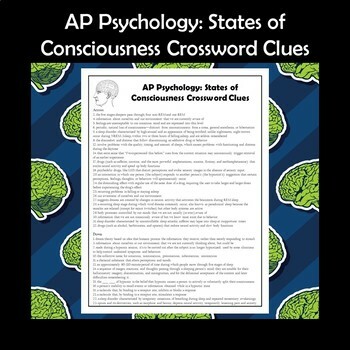 The puzzle includes the crossword template for writing in answers, the key showing correct responses, a list of crossword clues, and an optional word bank that can be used to differentiate in order to best meet your students' needs. Great for homework, substitute work, bell ringers/First 5 work, assessment, or supplementary study. 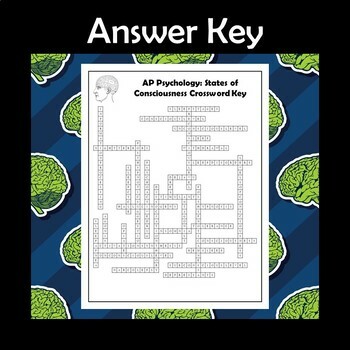 Please check out the thumbnails, be sure to let me know if you have any questions, and remember to check out my other resources (including more AP Psychology products) in my store!